0" 3" 7.5" 14" 20.5" 27" 33.5"
This template can be a real time saver! The grow site spacing is 6.5" on center all three chambers. Step 1. 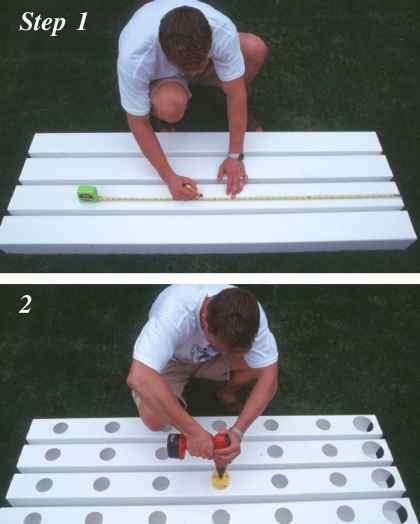 Using either the template provided or your own design, you must first layout each of the holes to be cut. It is best to mark and measure them center to center. Make sure to pay close attention to avoid any mistakes which can be very costly in both time and materials. Step 2. Using the 2 7/8" hole saw and a cordless drill to cut each of the grow sites and a 4" hole saw for the access ports (one per chamber, on right side of the chambers shown here) The 14v cordless drill I used here has cut hundreds of holes over the last year! A single charge was enough to finish the four chambers shown here each with 6 grow sites and 1 access port. Step 3. The 5" and 6" growth chambers each have an internal spray line which needs to be suspended from the top of the chamber. 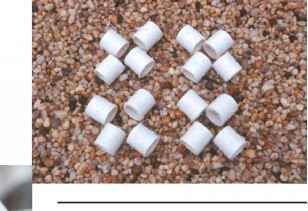 To do this, cut spray line clips from the 1/2" PVC pipe - 3/4" to 1" long works best - use 3-5 per chamber and glue them exactly between the grow sites so as not to block the spay holes placed just off to the side of each grow site. The black arrow denotes how the spray line passes through each of the clips. 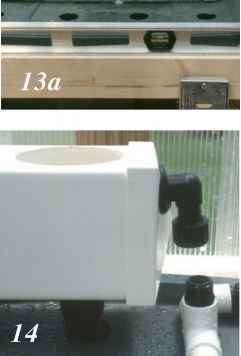 Cut 3/4" - 1" sections of 1/2" PVC pipe to make the spray line clips shown above. They are glued into the chambers using PVC cement. For best results, use PVC primer before applying glue to soften the material and provide a better glue joint. Step 4. Endcaps for the 5" PVC chambers need to be glued on using PVC cement. Use PVC primer first on both surfaces to be glued. 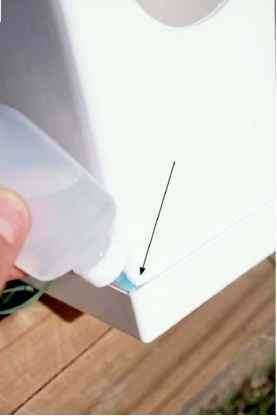 Stand the chambers on end and use a small squirt bottle to fill any gaps between the cap and chamber to prevent leaks. Step 5. Assemble your system so that each chamber is evenly spaced apart on the saw horse support. 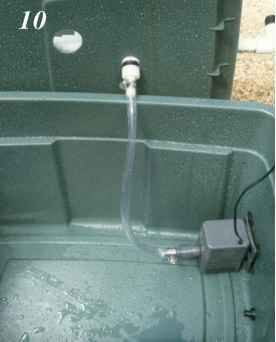 It is best to leave yourself a few inches of space between the bottom of the chambers and the lid of your reservoir. Measure the spacing from the center of one chamber to the center of the next to determine the spacing of spray lines on the manifold below. Step 6. 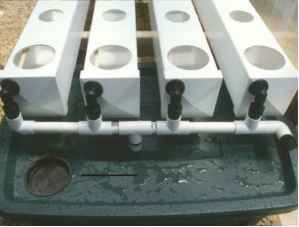 Layout the manifold parts as shown here and measure out the lengths of 3/4" PVC pipe you will need to complete the manifold. You may wish to refer to the next page for more photos of the complete manifold and how it attaches to the system for further clarification. Step 7. Assemble the internal spray lines from the parts shown here - 3/4" FGH swivel adapter with a compression end, .375 ID poly spray line, 10 mm insert plug and a 1" rubber grommet to seal the entry point of the spray line into the growth chamber. Begin by cutting the poly spray lines down to the exact inside length of your chambers. You will then need to use a 1/8" drill to puncture spray holes into each line just off to each side of every grow site. Keep the holes about a half inch from the grow sites so the don't get blocked by the spray clips installed in the previous steps. Note. Once you insert the spray lines into the compression end of the adapters, they are nearly impossible to remove without damage. Test fit everything first! You only need to insert about 1/2" into the compression end for a good seal. Step 8. Using a 1 3/8" hole saw, cut a hole into each of the endcaps to accommodate the spray lines. Center this hole exactly 1 1/8" down and 1 1/8" over from the same corner the spray line clips are attached. You will use a 1" I.D. rubber grommet (shown in the next step) to seal the compression fitting as it passes through this hole. Step 9. 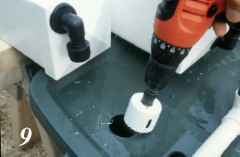 Using a 1.5" hole saw, cut a hole for each chamber's drain fitting to mate with the lid of your reservoir. I have found the simplest way to measure and mark off the location for these holes is to connect all chambers to the injection manifold, position them over the reservoir and mark the center of each drain hole by sighting down each drain fitting. Step 10. 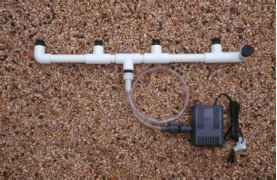 Connect your submersible pump as shown here using a length of vinyl tubing and a nylon barb to female hose thread adapter. I've had great success using the RIO series of submersible pumps with this garden design, Model 1100 shown here. Note. There are actually two options available when making the drain stems. 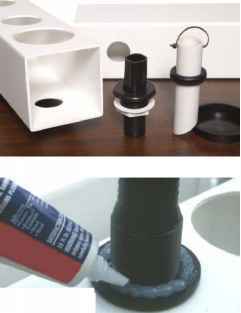 The first would be to use the bulkhead fitting and nut as shown at left, the second is to use a rubber grommet and 1 1/4" PVC stub. Cost and availability of the materials will help you decide as I've found both to work equally as well. Step 12. 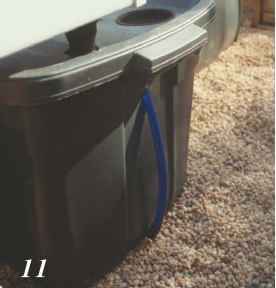 If you choose to use the bulkhead fitting, be sure to seal with Aquarium-safe silicone sealant to prevent leaks. Apply as shown here. If you choose to go with the grommet method, it helps to apply a thin coating of nontoxic silicone grease to the inside of the grommet to allow the level tube to move up and down easily. Step13. Assemble your stand from 2 saw horse kits and some 2x4 lumber. Use a level placed between the two saw horses to make sure the chambers will lay flat, with zero slope. 13a. Place the level across each sawhorse to make sure all the chambers will be at the same height. Step 14. You are now ready to connect the chambers to the injection manifold as shown in the sequence of photos here. 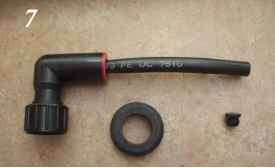 How to fold a hydroponic layflat hose? 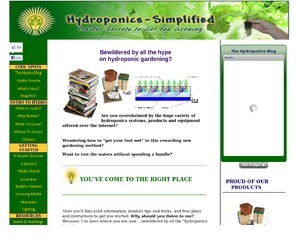 How to hydroponics step by step? 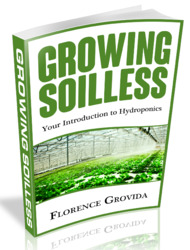 What food grows on hydroponics wetlands?